A new study shows clearly that a muscle protein called troponin T has a role in the formation of muscle fibres and the maintenance of muscle integrity. 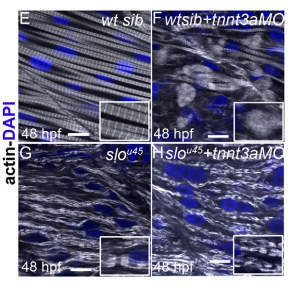 In a study of gene inactivation in zebrafish, the researchers have shown that defective troponin T can lead to disintegration of muscle fibres. Analysis in the sloth mutant: a 48 hpf wild-type sibling displays normally striated fast fibres (E). In a wildtype sibling injected with the tnnt3a MO (F), myofibrils undergo degradation and actin becomes diffuse. In a sloth mutant embryo (G), actin is distributed in thick filament-free sarcomere-like blocks along myofibrils. In a sloth mutant injected with tnnt3a MO (H), actin remains in blocks rather than dispersed in the cytoplasm. Using a combination of mutation and gene-knockdown in the zebrafish, the team studied the effect of the loss of several genes at a time. The new observations mirror those seen in some human patients who lack functional troponin T.
Muscle cells are built with an elaborate architecture that enables them to coordinate contraction and to generate force. The basic unit is called a sarcomere: within this, myosin proteins ‘ratchet’ over actin to draw the muscle shorter. Other proteins and molecules, including troponins, modulate contraction and rest cycles. Troponin’s main role in mature muscle is to allow contraction to occur when Ca++ ions are released into the sarcomere as a result of nerve stimulation. “Zebrafish have great genetics, rapid development and transparent embryos,” explains Derek Stemple, Senior Group Leader, from the Sanger Institute, “all of which give us a great way to tease apart the workings of complicated structures such as the sarcomere. There are three types of troponin T, which are expressed in different types of muscle. People who lack working ‘slow-twitch troponin T’ suffer muscle weakness; those who lack working ‘fast-twitch troponin T’ suffer from a disorder where fingers, hands and toes are clenched and contracted. Mutations in the third type of troponin T are associated with heart disease. When troponin activity is lost, the normal control of actin-myosin activity goes away leading to continuous contraction, which in turn destroys the muscle fibre. The team showed that sarcomeres do not assemble properly when troponin T activity is completely removed. Paradoxically, when the researchers blocked myosin as well as troponin T activity the sarcomere structure was less disrupted and appeared more normal. This double disruption, however, revealed a second role for troponin T, as the sarcomere structure appeared recovered but one of its components, the thin filament, was still not normal. “We found a novel role for troponin T in assembly of a component of sarcomeres called thin filaments,” explains Mariella Ferrante, first author on the study, former researcher at the Sanger Institute and now at the Stazione Zoologica Anton Dohrn in Naples, Italy. “Troponin T is required for the proper assembly of thin filaments and thus the production of functioning sarcomeres and hence development of effective muscle. The tools available to zebrafish researchers allow a comprehensive and insightful study. Using gene knock-down technologies, the team also explored how disrupting the activity of a single troponin T gene in the zebrafish affects muscle development. Early development appeared normal and sarcomeres appeared largely unaffected, as zebrafish protect by having more than one troponin T gene and protein: if one is lost, another might compensate. However ultimately sarcomere organisation was impaired, causing a loss of muscle function. Mutations in troponin T in the skeletal muscle are linked to at least two human diseases: the consequences of one, Nemaline myopathy, a disease of slow-twitch muscle, resemble the effects of removing functional troponin T in zebrafish.